Trailblazing author and illustrator Brian Selznick stunned the literary world upon the publication of his first novel The Invention of Hugo Cabret. Ping-ponging back and forth between words and pictures, Hugo's story came alive, not just in words, but also in his stunning pencil sketches that narrated the story just as much as the words did, if not more so. In Wonderstruck, Selznick repeats that same word/picture dynamic but this time with a twist: Selznick tells the story of the two main characters in different ways. Ben's story is told through words and Rose's story through pictures. Told fifty years apart, Ben and Rose's stories appear to be completely disconnected, their only relation to each other being juxtaposed scenes that are similar in tone and symbolism (e.g., both Ben and Rose experiencing a storm raging outside and also within themselves). Ben's story is that of a boy who just lost his mother. Now living with his aunt and uncle, he longs to learn more about his family history, namely the father he never knew. When disaster strikes yet again for Ben, rather than allowing himself to wallow in pity, he sets out to learn about the father he never knew. When we first meet Rose, her story is much more ambiguous since the reader only has pictures to help guide them through the narrative. We immediately surmise that she greatly admires a famous film star and also see that she is trying to run away from something at her house that she does not want to deal with. Saying any more than that would give too much away and affect the reader's enjoyment of the story as their eyes light up in realization as to what is going on. This book is my current read-aloud with my sixth graders and I'm using my document camera to share Rose's story. It is so fun to see their own eyes light up and hear "Oooooh!" throughout the room as important realizations and revelations hit them. I thoroughly enjoyed this book and I'm enjoying sharing it with my class even more. 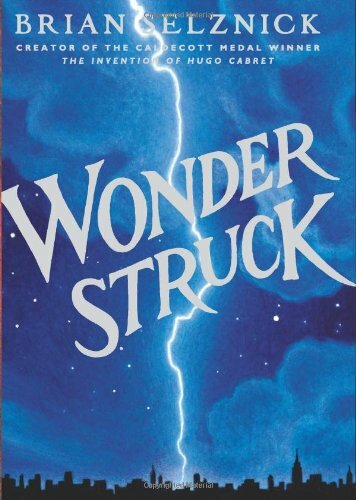 As kids and adults alike experience this story for themselves, it would be easy to overlook Selznick's writing ability given his mesmerizing illustrations. But not only is Brian Selznick an amazingly gifted artist, we should not ignore his talent as a writer. What makes Wonderstruck such a work of genius is that both the text and the illustrations add to the emotion of the story. There were certain pictures I viewed that caused me to audibly gasp they were just so breathtaking, but then there was also the perfect pacing of the text that brought the story to a flawless emotional climax. My one criticism of the book would be that there were too many instances where things were just a little too neatly woven together and foreshadowing was a little too obvious, but given the unusual nature of the way the story is being told, being obvious and overly neat is necessary to guide the reader through the story without an excessive amount of confusion. One must remember that this is a book written for kids after all. I'm so envious that you get to see all those kids react to that book. I think that would be more fun even than reading it! I really want to read this one. I absolutely love the cover, and it sounds like such a beautiful read. I don't want to take all the credit... I got the idea to use the document camera from a teacher on Twitter. I'm pretty sure it was Donalyn Miller who suggested it.